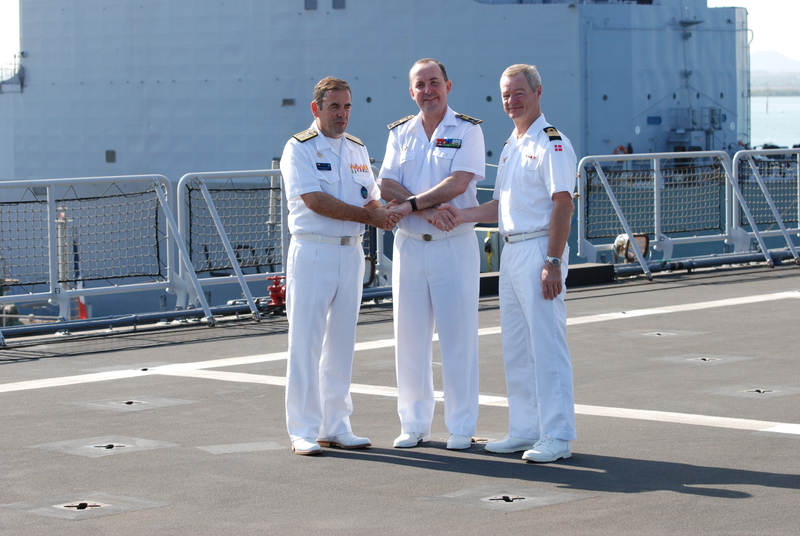 The EU Naval Force Somalia Operation change of command ceremony onboard HNLMS Johan de Witt in the Port of Djibouti provided an ideal opportunity for three incoming commanders of the counter piracy operations off the coast of Somalia to meet and discuss upcoming operations. During the next few months Rear Admiral Eugene Diaz del Rio, Spanish Navy, Commander of the NATO task force, Rear Admiral Hervé Bléjean, French Navy, Commander of the EUNAVFOR task force and Commodore Aage Buur Jensen, Danish Navy, future Commander of the Combined Maritime Force Task Force CTF 151 will be working closely together in order to deter piracy, which still poses a threat to maritime security and prosperity. While in Djibouti, Commodore Buur Jensen also had the chance to talk to representatives from the EUCAP Nestor, which works to strengthen maritime law enforcement capacities in the Horn of Africa.